There seems to be a lot of confusion—and some chest-thumping—in the press about “shooting down” North Korea’s rocket during its upcoming launch. For example, headlines like that in the Boston Globe on April 1—“Japan plans to shoot down N. Korea missile”—clearly convey the idea that Japan and others could stop the launch by shooting down the rocket with a missile defense system. A Google search shows there have been many dozens of headlines like this over the past week. The headline writers seem to have the misperception that missile defense interceptors could shoot down the rocket, and their headlines have passed that misperception on to millions of people. But neither the U.S., Japan, nor South Korea have any systems that could intercept the launcher in flight (more on that below). Fortunately, the content of most of these articles, when you actually read them, makes technical sense. They make it clear that Japan and South Korea say they will try to intercept pieces of the rocket falling to earth if it looks like they might hit a populated area. That’s not intercepting the launcher—that’s swatting away the debris. That could be useful, but people should be clear about what’s being proposed. 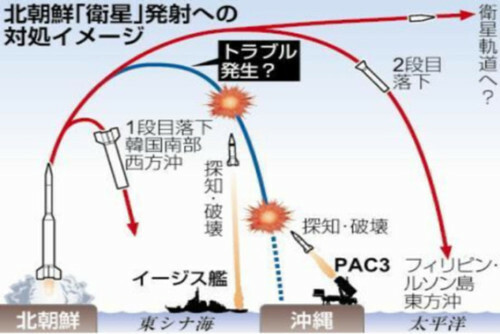 The diagram above, which originally appeared in the Japanese newspaper Sankei Shimbun, clearly shows that the intent is to intercept debris and not the rocket itself. It shows the empty first and second stages falling to earth after they have burned their fuel, with the third stage that carries the satellite still accelerating in the upper right corner. The blue line is the path of the shroud, which covers the satellite during the early part of launch and is ejected while the second stage is burning. The diagram shows the PAC3 and ship-based Aegis interceptors being fired to intercept the shroud as it falls. Such loose talk suggests options that don’t actually exist. The last sentence in this quote makes clear that the goal is to intercept the rocket during launch and not the satellite once it is in orbit, since once the booster finishes accelerating the satellite and placing it in orbit, North Korea would have gotten the information it needs about the operation of its launcher technology to continue its missile development program. Could the U.S., Japan, or South Korea shoot down the rocket? No. There are currently no missile defense systems that could shoot down the rocket during its boost phase. The Aegis system is intended to engage warheads in “midcourse” phase, after the missile has burned out and the warheads are coasting above the atmosphere on a predictable path. Aegis was not developed to be able to intercept an accelerating missile in boost phase. Similarly, the U.S. ground-based midcourse missile defense (GMD) system can’t attempt an intercept until boost phase ends, and the interceptors are not close enough to the launch site to reach the rocket during its boost phase in any event. Both Aegis and PAC3 can try to intercept the shroud and the empty stages as they fall to earth after the end of their boost phase, which is what the diagram above shows. But even that is likely to be very difficult since these objects are likely to be tumbling, and tumbling objects turn out to be very hard for an interceptor to hit (since the kill vehicle’s sensor sees a fluctuating image). A lot of effort is put into making the targets used in missile defense tests fly in a stable and well-defined way. It’s worth noting that the GMD system has still not been tested against tumbling warheads, which are considered to be “stressing” targets. The U.S. is currently not working on any boost-phase missile defense systems, and without that there is not much you can do to interfere with the launcher.